Background: Deletions in chromosome 3 occur frequently in uterine cervical carcinoma (CA-CX). The common consensus regions deleted during CA-CX development are not well defined, and have not been correlated with tumour progression. Aims: To define specific regions of chromosome 3 deleted during development of CA-CX and to correlate these with clinicopathological data. Methods: Deletion mapping of chromosome 3 was done in seven cervical intraepithelial neoplasia (CIN) and 43 primary CA-CX samples using 20 highly polymorphic microsatellite markers. Results: Deletions of chromosome 3 were significantly associated with tumour progression. High frequencies (33–53%) of loss of heterozygosity (LOH) were found in 3p26.1, 3p22.3, 3p21.2, and 3p13, suggesting the location of putative tumour suppressor genes (TSGs) in these regions. Among these four regions, deletions in 3p21.2 were suggested to occur early during CA-CX development. A significant correlation was found between LOH at 3p26.1 and 3p22.3 with tumour progression from stage I/IIB to stage III/IV. No association was found with the highly deleted regions and human papillomavirus positivity, parity, or menopausal status. Microsatellite size alteration was seen in only seven of the samples. However, rare biallelic alterations were seen in and around the highly deleted regions. Loss of normal copy of chromosome 3 and interstitial alterations in chromosome 3p were seen in some samples. Conclusion: These four regions on chromosome 3p may be differentially deleted during specific stages of CA-CX development. The putative TSGs located in these regions may have a cumulative effect on tumour progression. Cytogenetic analysis of CA-CX lesions, although limited, has revealed frequent non-random chromosomal aberrations, including deletions, amplifications, and isochromosome formation.16 Comparative genomic hybridisation of cervical tumours has identified over-representation of chromosome 3q as a recurrent event in invasive tumours and under-representation of chromosomal arms 2q, 3p, 6p, 8p, 11q, and 13q during tumour progression.17,18 Whereas gain on chromosome 3q may represent the presence of an oncogene at this locus, chromosomal losses might represent the location of putative TSGs. Loss of heterozygosity (LOH) studies of primary CA-CX have shown allelic loss on several chromosomal arms, such as 3p, 6p, 11q, and 18q.19,20 Although the involvement of chromosome 3p deletions in the development of CA-CX has been confirmed by LOH studies using chromosome specific probes, there are several discrepancies between the reports defining the commonly deleted regions and frequencies of LOH. Mullokandov and colleagues20 found an overall frequency of 39% LOH at the 3p21.3, 3p22.1–24.1, and 3p25.1–25.3 regions, whereas Larson and colleagues21 detected an overall frequency of 70% LOH in CA-CX, with the most frequent deletion being at the 3p14 region. However, the highest frequencies of LOH detected by Mitra et al were 40% and 32% at the 3p21.33–22.1 and 3q28–29 regions, respectively, in CA-CX samples from Indian patients using restriction fragment length polymorphism (RFLP) markers.19 Some investigators reported a gradual increase in the deletion frequency of chromosome 3p alleles along with tumour progression using samples at different stages from the same individual, but no statistical correlations were made with the associated regions, probably because of the low sample number.22,23 In addition to LOH, microsatellite size alteration (MA) is another genetic change that has been associated with several human cancers.24 The mechanisms underlying MA are currently unknown, but they probably represent a form of genomic instability.24 About 35% of CA-CX samples of Western origin have been shown to exhibit MA.22 Hampton and colleagues25 have demonstrated an association between ethnicity and aetiological factors and the chromosomal deletions seen in CA-CX development; the frequency of chromosome 4p deletion differed between CA-CX samples of Indian origin and those from patients of white/Hispanic/American black origin using the same RFLP probes. Until now, few attempts have been made to carry out deletion mapping of chromosome 3 in CA-CX samples from Indian patients using highly polymorphic microsatellite markers to evaluate the deletion pattern, in addition to localising the candidate TSGs associated with the development of this tumour. Thus, in our present study, we have attempted to map the frequently deleted regions on chromosome 3 in 50 cervical lesions of Indian patients using 20 highly polymorphic microsatellite markers. The deletion pattern and MA were correlated with different clinicopathological parameters, such as clinical stage, HPV infection, and menopausal status, to investigate whether there is an association between any of these factors and chromosomal alterations. Fifty freshly operated uterine cervical lesions from previously untreated and unrelated individuals with corresponding normal tissue or peripheral blood leucocytes were used for our analysis (table 1). The tissues were obtained from the patients treated at the hospital section of Chittaranjan National Cancer Institute, India after appropriate informed consent by the patients and approval of the protocol by the hospital authorities. The samples were frozen immediately after collection and stored at −80°C until use. Table 1 provides a detail clinical history of the patients. Clinically, the tumours were graded and staged according to the FIGO classification. The average age of the patients was recorded as 44 years, with a mean length of time married of 16 years and parity ranging from one to 10. Twenty three of the patients were premenopausal, whereas the remainder (27) were postmenopausal. Twenty highly polymorphic microsatellite markers spanning the entire length of chromosome 3 (fig 1) were selected for our analysis. Fifteen markers were taken from the chromosome 3p region and five markers from 3q (fig 1). The SST marker from the chromosome 3q27.3 region was used as a control. All the markers showed > 69% informativity in our samples (data not shown). The localisation and physical distance between the markers were obtained from http://genome.ucsc.edu, except for D3S1289, in which case the information was obtained from the Genome Database. Allele status of the chromosome 3 markers in the primary uterine cervical lesions. LOH, loss of heterozygosity; MA-1, microsatellite size alteration of one allele; MA-2, microsatellite size alteration of both alleles; LOH/MA, loss of one allele and size alteration of the other; RH, retention of heterozygosity; NI, non-informative; CIN, cervical intraepithelial neoplasia. D3S1297 is 1.9 Mb from chromosome 3p telomere. The presence of HPV in the cervical lesions was detected by performing PCR using primers (MY09 and MY11) from the consensus L1 region.31 Typing of HPV-16/18 in the L1 positive samples was done by means of PCR using specific primers from the E6 region of HPV-1632 and the E7 region of HPV-18.33 The PCR products were electrophoresed in 2% agarose gel, stained with ethidium bromide, visualised under ultraviolet light, and photographed. For final confirmation of the HPV types, after gel electrophoresis the PCR products were transferred on to a nylon membrane for Southern hybridisation with [32P] labelled HPV type specific probes.34 DNA from the SiHa (for HPV-16) and HeLa (for HPV-18) cell lines and the HPV type specific plasmids were used as positive controls. To correlate regional loss with the progression of the tumour, we calculated the mean FAL index for each histological category (table 1). The t statistic was used for comparison of the mean FAL index of these histological groups. We performed χ2 analysis to determine the association between LOH at highly deleted regions and different clinicopathological features, such as parity, the length of time married, menopausal status, HPV infection (table 2), and tumour stage (fig 2). A p value < 0.05 with Yates correction was considered to be significant. 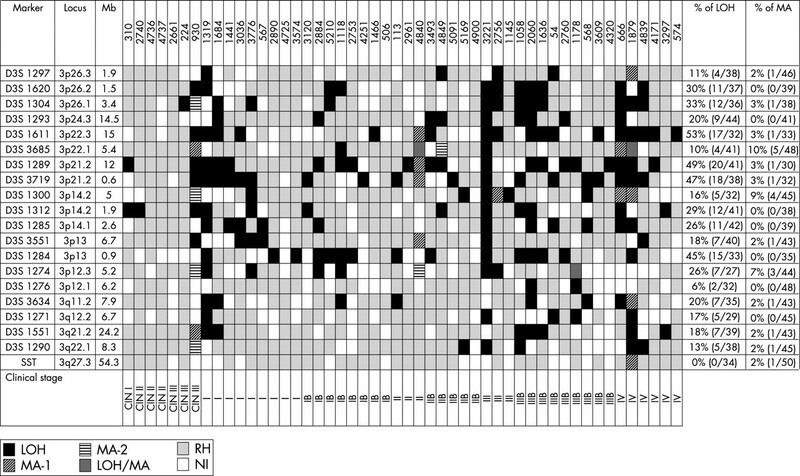 Pattern of deletions in the highly deleted regions of chromosome 3 during uterine cervical carcinoma progression. CIN, cervical intraepithelial neoplasia; LOH, loss of heterozygosity. Deletion mapping of chromosome 3 in the primary cervical lesions revealed that 44 of the 50 samples showed LOH/MA for at least one marker (figs 1, 3). All the 44 samples with alterations showed LOH, whereas only seven showed MA, indicating the importance of chromosome 3 deletions in the development of CA-CX. The allelic losses of chromosome 3 gradually increased with progression of the clinical stage, and there was a significant correlation between the mean FAL index (p < 0.05) and progression of the tumour (table 1). 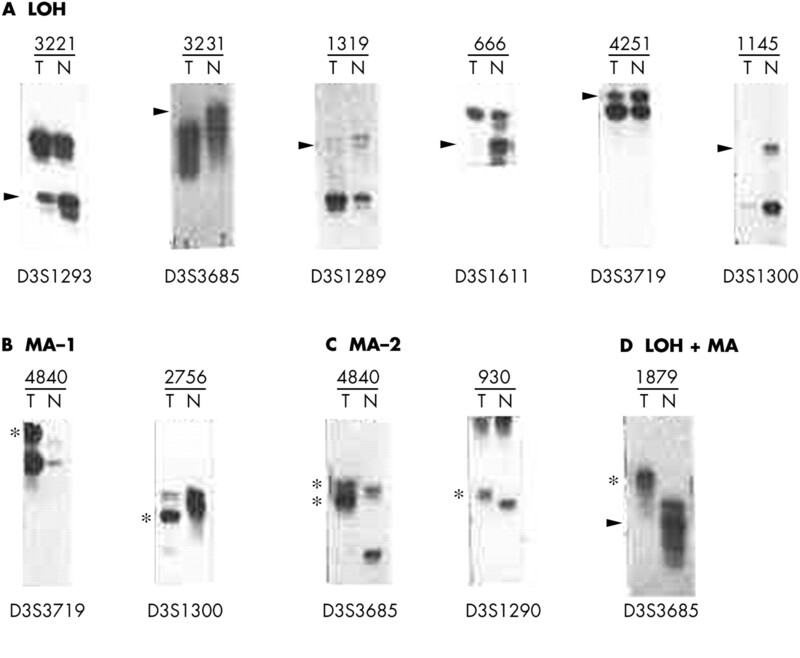 Representative autoradiograph showing (A) loss of heterozygosity and (B) microsatellite size alteration at different marker loci on chromosome 3 in different samples. T, DNA from dysplastic/tumour cells after microdissection; N, corresponding normal tissue or peripheral blood leucocytes. Sample numbers are the same as in fig 1. Arrows indicate loss of the corresponding allele and the asterisks indicate size alteration of one or both alleles. The highest LOH frequencies of 33%, 53%, 48%, and 45% were detected at the chromosomal regions 3p26.1 (D3S1304), 3p22.3 (D3S1611), 3p21.2 (D3S1289/D3S3719), and 3p13 (D3S1284), respectively (fig 1). However, the highest frequency of MA (10%) was seen at the 3p22.1 (D3S3685) locus (fig 1). No sample showed high microsatellite instability; that is, ≥ 40% MA in the markers tested. Four cervical lesions (930, 1319, 3221, and 1879) showed molecular abnormalities (LOH or MA) at all the informative loci, indicating loss of normal copy of chromosome 3 in these lesions (fig 1). Eight samples (1684, 3776, 4840, 3493, 2756, 1058, 2060, and 666) showed LOH and/or MA in more than two consecutive markers, particularly around the high LOH regions (fig 1). No homozygous deletion was found in these samples. However, five lesions (930, 4840, 4849, 1178, and 1879) showed rare biallelic alterations (MA-2 or LOH + MA) at four loci (fig 1) in and around the high LOH regions. Forty four of the 50 cervical lesions were positive for HPV infection (table 1) using the consensus L1 primers. Among the HPV positive samples, 36 of 44 were positive for HPV-16 and eight of 44 were positive for HPV-18. No correlation was found between HPV infection with other clinicopathological parameters (data not shown). Chi square analysis revealed a significant correlation between LOH at the 3p26.1 and 3p22.3 regions and clinical stage (p = 0.005–0.04) and LOH at 3p21.2 with parity (p = 0.048) (table 2). No such correlation was found between the four highly deleted regions mentioned earlier and other clinicopathological parameters, such as length of time married, menopausal status, and HPV infection (table 2). In addition, no association was found between the frequency of MA and different clinicopathological parameters (data not shown). In our present study, we attempted to delineate a detailed deletion map of chromosome 3 in seven CIN lesions and 43 CA-CX lesions at different clinical and histological stages from an Indian patient population. We found that the short arm of chromosome 3 was preferentially deleted during the development of CA-CX. The gradual increases in the mean FAL index from CIN to stage III–IV tumours were indicative of the accumulative nature of the deletions occurring in different chromosome 3 regions during progression of the tumour. Although a similar type of accumulative increase in the frequency of chromosome 3 deletions was observed during the development of CA-CX in a Western patient population,22,23 and in the development of lung carcinoma,28 the analysis procedure used in these studies was different to ours. Those investigators analysed CIN/dysplastic samples and invasive samples from the same individuals, whereas we analysed CIN and invasive samples from different individuals. Among the four highly deleted regions, deletions in the 3p26.1 and 3p22.3 regions appeared to be associated with the development of stage III–IV CA-CX tumours because of a significant increase of LOH frequency compared with stage I–IIB tumours (p = 0.04–0.005) (fig 2). Although the deletion in these two regions overlapped with the deleted regions seen in CA-CX tumours in other studies,21,23,35 none of these investigators showed a significant association of the deletions with progression of the tumour. The marker D3S1304 on the 3p26.1 region used in our study is approximately 3.3 Mb further towards the telomere than the VHL gene, which is associated with the development of renal cell carcinoma (RCC) and related tumours.36 Thus, VHL or another nearby gene might be involved in the progression of later stages of CA-CX tumours. The D3S1611 marker on the 3p22.1 region is intragenic to the mismatch repair gene MLH1.37 However, we did not see a high frequency of MA in the cervical lesions studied. This indicates that the mutator phenotype might not be prevalent in the development of CA-CX. This observation corroborates well with other studies on this tumour.16 Thus, the high frequency of allelic losses at the MLH1 locus suggests that apart from mismatch repair function, the deregulation of other possible functions of MLH1 (for example, homologous recombination, mediation of the G2 checkpoint, transcription coupled nucleotide excision repair, recognition of DNA damage, and apoptosis) might be associated with progression of the tumour.38 However, the analysis of other genetic/epigenetic alterations (mutation, methylation, etc) of the MLH1 gene in cervical lesions is necessary to know the exact mechanism of inactivation of this gene. Adjacent to the MLH1 locus another TSG, DLC1, was found to be located about 1 Mb towards the centromere,39 but its involvement in the development of CA-CX has not yet been studied. 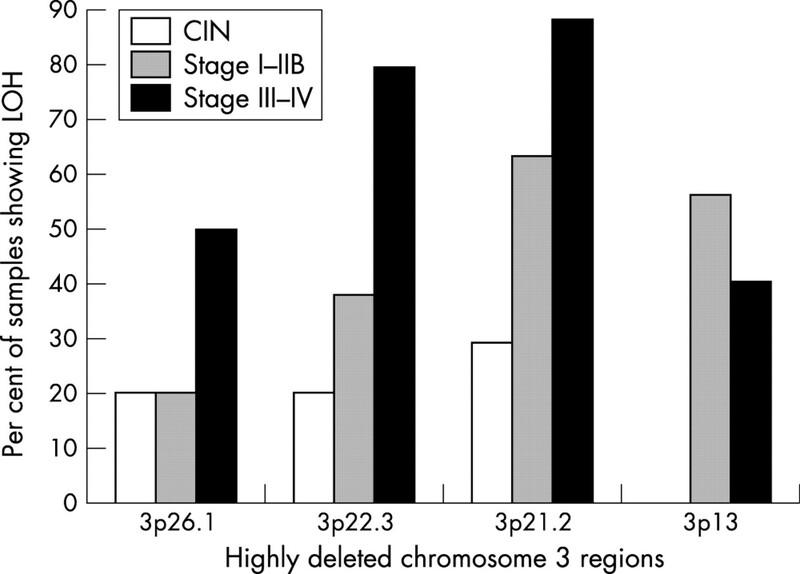 Deletion in the 3p21.2 region increased gradually from CIN to stage III–IV tumours and this region showed the highest percentage of deletion of all the four highly deleted regions at every stage of disease (fig 2). Thus, it seems that deletion in the 3p21.2 region might be the earliest event among the four highly deleted regions. Similar to our results, Kersemaekers and colleagues40 and Guo and colleagues23 have detected a high frequency of LOH in this region in this tumour type. However, no candidate TSG has been identified in this region, although a cluster of candidate TSGs including FUS1, RASSF1, SEMA3F, ARP, and BAP1 are located about 3.0 Mb away, between the telomere and the D3S1289 locus of the 3p21.2 region.41 Nevertheless, an association of these genes with the development of CA-CX has not yet been documented. The absence of LOH at 3p13 in CIN lesions but the high incidence of LOH in later stages of carcinoma indicate that deletions in this region might be necessary for progression of the tumour from CIN to stage I–IIB (fig 2). This region overlaps with the homozygously deleted region observed at chromosome 3p12–13 in a cervical carcinoma cell line.42 Similarly, Wong et al have identified 52% LOH at the 3p13 region in CA-CX tumours.43 The chromosome 3p12–14 region has been shown to suppress the tumorigenicity of an RCC cell line in a microcell hybrid system, suggesting the presence of a candidate TSG in this region.36 Two candidate TSGs, NRC1 and ROBO1/DUTT1, associated with the development of RCC and lung cancer, respectively, are located in the 3p12–14 region.44,45 However, we did not see high LOH in the ROBO1/DUTT1 locus using the adjacent marker D3S1274, although we have seen high LOH in this locus in primary head and neck squamous cell carcinoma.46 The role of these genes in the development of CA-CX has not been analysed. The low incidence (16%) of LOH in the D3S1300 locus, an intragenic marker of the FHIT gene, indicates that this gene is probably not associated with the development of CA-CX. However, using the same marker, Wistuba et al detected 56% LOH in this tumour type.22 This difference in deletion frequency might result from differences in ethnicity, as reported by Hampton et al.25 The involvement of this gene in the development of CA-CX cannot be ruled out completely without analysis of the mutation, methylation, and aberrant transcription profiles of this gene. Thus, it can be concluded from our analysis that the differential deletions in the four highly deleted regions seen in chromosome 3p in the uterine cervical lesions are necessary for the development of specific stages of CA-CX progression. The loss of function of TSGs located in these regions may have a sequential cumulative effect in the development of this tumour. In addition, Huebner50 has suggested that compound mutations in different TSGs located in different chromosome 3p regions are necessary for the development of lung, kidney, and other cancers. Along with these deletions, other molecular changes in the chromosome, such as MA, biallelic alterations, interstitial alterations, and loss of normal copy of chromosome 3, might play some role in tumour progression by imposing some selective pressure that provides a growth advantage for the tumour. We are thankful to the Director, Chittaranjan National Cancer Institute (CNCI), Calcutta-700 026, India and Drs PS Basu, R Mondal, and S Mondal for their encouragement and help during this work. We are also grateful to Professor HZ Hausen and Dr EM de Villiers for their generous gift of HPV-16/18 plasmids. Financial support for this work was provided by grant number 27 (0111)/00/EMR-II from CSIR, Government of India. Parkin DM, Pisani P, Ferlay J. Estimates of the worldwide incidence of eighteen major cancers in 1985. Int J Cancer1993;54:594–606. Sankaranarayanan R, Nair MK, Jayprakash PG, et al. Cervical cancer in Kerala: a hospital registry-based study on survival and prognostic factors. Br J Cancer1995;72:1039–42. Murthy NS, Mathew A. Screening for cancer of the uterine cervix and approaches adopted in India. Indian J Cancer1999;36:154–62. Brinton LA, Fraumeni JF, Jr. Epidemiology of uterine cervical cancer. J Chronic Dis1986;39:1051–65. Ponten J, Adami HO, Bergstrom R, et al. Strategies for global control of cervical cancer. Int J Cancer1995;60:1–26. Schiffmann MH, Brinton AB. The epidemiology of cervical cancer. Cancer1995;76:1888–901. Franco EL. Epidemiology in the study of cancer. Encyclopedia of Cancer1997;1:621–41. Yliotalo N, Sorensen P, Josefesson A, et al. Smoking and oral contraceptives as risk factors for cervical carcinoma in situ. Int J Cancer1999;81:365–75. Azzena A, Zen T, Ferrara A, et al. Risk factor for breast cancer. Case–control study results. Eur J Gynaecol Oncol1994;15:386–92. Tavani A, Negri E, La Vecchia C. Menstrual and reproductive factors and biliary tract cancers. Eur J Cancer Prev1996;5:241–7. Zur Hausen. Human papilloma virus. Annu Rev Microbiol1994;48:427–47. Howley PM. Papillomavirinae. The viruses and their replication. In: Fields BN, Knipe DM, Howley PM, eds. Virology, Vol. 2. Boston: Harvard University, 1995:2045–76. Shah KV, Howley PM. Papilloma viruses. In: Fields BN, Knipe DM, Howley PM, eds. Virology, Vol. 2. Boston: Harvard University, 1995:2077–109. Zur Hausen. Papilloma virus causing cancer: evasion from host cell control in early events in carcinogenesis. J Natl Cancer Inst2000;92:690–8. Larson AA, Kern S, Sommers RL, et al. Analysis of replication error phenotypes in cervical carcinoma. Cancer Res1996;56:1426–31. Lazo PA. The molecular genetics of cervical carcinoma. Br J Cancer1999;80:2008–18. Heselmeyer K, Schrock E, du Manoir S, et al. Gain of chromosome 3q defines the transition from severe dysplasia to invasive carcinoma of the uterine cervix. Proc Natl Acad Sci U S A1996;93:479–84. Allen DG, White DJ, Hutchins AM, et al. Progressive genetic aberrations detected by comparative genomic hybridisation in squamous cell cervical cancer. Br J Cancer2000;83:1659–63. Mitra AB, Murty V, Li RG, et al. Allelotype analysis of cervical carcinoma. Cancer Res1994;54:4481–7. Mullokandov MR, Kholodilov NG, Atkin NB, et al. Genomic alteration in cervical carcinoma: losses of chromosome heterozygosity and human papilloma virus tumor status. Cancer Res1996;56:197–205. Larson AA, Kern S, Curtiss S, et al. High resolution analysis of chromosome 3p alterations in cervical cancer. Cancer Res1997;57:4082–90. Wistuba II, Montellao FD, Milchgrub S, et al. Deletions of chromosome 3p are frequent and early events in the pathogenesis of uterine cervical carcinoma. Cancer Res1997;57:3154–8. Guo Z, Hu X, Afink G, et al. Comparisons of chromosome 3p deletions between cervical precancer synchronous with and without invasive cancer. Int J Cancer2000;86:518–23. Fishel R. Genomic instability, mutators, and the development of cancer: is there a role for p53? J Natl Cancer Inst1996;88:1608–9. Hampton GM, Larson AA, Baergen RN, et al. Simultaneous assessment of loss of heterozygosity at multiple microsatellite loci using semi-automated fluorescence-based detection: subregional mapping of chromosome 4 in cervical carcinoma. Proc Natl Acad Sci U S A1996;93:6704–9. Dasgupta S, Mukherjee N, Roy S, et al. Mapping of the candidate tumor suppressor genes’ loci on human chromosome 3 in head and neck squamous cell carcinoma of Indian patient population. Oral Oncol 2002;38:6–15. Melamed J, Einhorn JM, Ittamann MM. Allelic loss on chromosome 13q in human prostate carcinoma. Clin Cancer Res1997;3:1867–72. Wistuba II, Behrens C, Milchgrub S, et al. Sequential molecular abnormalities are involved in the multistage development of squamous cell lung carcinoma. Oncogene1999;18:643–50. Dillon EK, Boer WB, De Papadimitriou JM, et al. Microsatellite instability and loss of heterozygosity in mammary carcinoma and its probable precursors. Br J Cancer1997;76:156–62. Ishwad CS, Ferrel RE, Rossie KM, et al. Microsatellite instability in oral cancer. Int J Cancer1995;64:332–5. D’Costa J, Saranath D, Dedhia P, et al. Detection of HPV-16 genome in human oral cancers and potentially malignant lesions from India. Oral Oncol1998;34:413–20. Park JS, Dong SM, Kim HS, et al. Detection of p16 gene alteration in cervical cancer using tissue microdissection and LOH study. Cancer Lett1999;136:101–8. Balaram P, Nalinakumari KR, Abraham E, et al. Human papilloma viruses in 91 oral cancers from Indian betel quid chewers—high prevalence and multiplicity of infections. Int J Cancer1995;61:450–4. Gillison ML, Koch WM, Capone RB, et al. Evidence for a causal association between human papilloma virus and a subset of head and neck cancers. J Natl Cancer Inst2000;92:709–20. Chung GT, Huang DP, Lo KW, et al. Genetic lesions in the carcinogenesis of cervical cancer. Anticancer Res1992;12:1485–90. Kok K, Naylor SL, Buys CHCM. Deletion of the short arm of chromosome 3 in solid tumors and the search for tumor suppressor genes. Adv Cancer Res1997;71:27–92. Papadopoulos N, Necolaids NC, Wei YF, et al. Mutation of a mutL homologue in hereditary colon cancer. Science1994;263:1625–9. Benachenhou N, Guiral S, Gorska-Flipot I, et al. Frequent loss of heterozygosity at the DNA mismatch repair loci hMLH1 and hMSH3 in sporadic breast cancer. Br J Cancer1909;79:1012–17. Daigo Y, Nishiwaki T, Kawasoe T, et al. Molecular cloning of a candidate tumor suppressor gene, DLC1, from chromosome 3p21.3. Cancer Res1999;59:1966–72. Kersemaekers AM, Hermans J, Fleuren GJ, et al. Loss of heterozygosity for defined regions on chromosome 3, 11 and 17 in carcinomas of the uterine cervix. Br J Cancer1998;77:192–200. Zabarovsky ER, Lerman MI, Minna JD. Tumor suppressor genes on chromosome 3p involved in the pathogenesis of lung and other cancers. Oncogene2002;21:6915–35. Aburatani H, Wang Y, Shibata H, et al. Identification of a region of homozygous deletion in cervical carcinoma [abstract]. Am J Hum Genet1994;55:A51. Wong WF, Chung TK, Cheung TH, et al. Frequent loss of heterozygosity of chromosome 3 short arm detected by PCR based microsatellite polymorphism in cervical squamous cell carcinoma. Cancer Lett1997;115:161–4. Sundaresan V, Chung G, Heppel-Parton A, et al. Homozygous deletion at 3p12 in breast and lung cancer. Oncogene1998;17:1723–9. Lovell M, Lott ST, Wong P, et al. The genetic locus NRC-1 within chromosome 3p12 mediates tumor suppression in renal cell carcinoma independently of histological type, tumor microenvironment, and VHL mutation. Cancer Res1999;59:2182–9. Scholes AGM, Woolger JA, Boyle MA, et al. Synchronous oral carcinomas: independent or common clonal origin? Cancer Res1998;58:2003–6. Adamson R, Jones AS, Field JK. Loss of heterozygosity studies on chromosome 17 in head and neck cancer using microsatellite markers. Oncogene1994;9:2077–83. Munger K, Heselmeyer K. The molecular pathogenesis of cervical cancer; the role of human papilloma virus. In: Gazdar A, Srivastava S, Henson DE, et al, eds. Molecular pathology of early cancer. Amsterdam: IOS Press, 1999:97–111. Huebner K. Tumor suppressor on 3p: a neoclassic quartet. Proc Natl Acad Sci U S A2001;98:14763–5.